Preston Shepherd entered the ministry in 1980 as a Campus Minister working with a small church in Bellingham Washington. Because of his love for God’s Word, he took a small discipleship group of three young men and suggested a goal of reading through the entire Bible in one year. Each week Preston would prepare an exam to test their comprehension of that week's assignment. The young men enjoyed learning and discussing what they read each week! 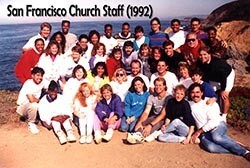 This type of activity became a standard practice in every place (Oklahoma City, Boston [Harvard University], Denver, San Francisco and Manila) that Preston served as a Minister. About 12 years later, while leading a large church of 1,400 members in San Francisco, California, Preston and the staff adopted the single for the church as a whole to read t hrough the entire Bible. With that many people, Preston felt it was important for each individual to have some type of booklet containing the assignment and a brief explanation of what the person had read. 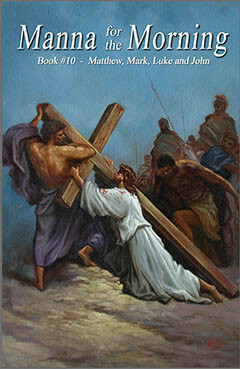 Preston went to several Christian bookstores, but was very disappointed not to find that type of booklet. Yes there were some booklets that gave a reading assignment, but none of them included any insights into the person's reading. Instead they offered a devotional thought, something like, a man and his dog in South Dakota. 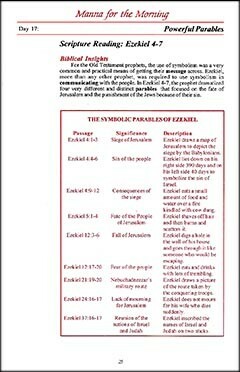 Obviously that had nothing to do with the daily Bible reading assignment. Preston decided to try to create and publish a guide himself. With only a few months lead time before the church was to begin their goal, he solicited the help of some trusted friends and associ ates. He called Ed Heinlein, one of his mentors in Bible study, to help in the writing. Sandie, his wife also did some writing as well as about 6 other staff members from the church. The word got out about what the project and other churches joined in the goal and made orders too! In the end, the books were finished - the goal accomplished - and over 20,000 people ordered and used the books that year! MANNA FOR THE MORNING™(MFM) was born! Twenty-five years later, Preston and Sandie have created this website and are still making the books available. The series have been translated into Tagalog, Russian, Spanish, Vietnamese and Thai. God has blessed their lives tremendously through the Manna books and their prayer is that others continue to be blessed through them too! 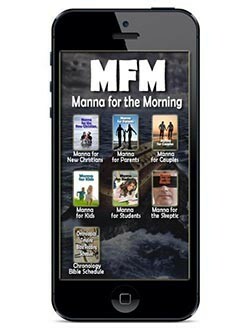 The next generation of MANNA FOR THE MORNING™is the "MFM™App" designed for both Android and Apple devices and will be introduced the summer of 2016! Because of a need in the Shepherd's House Church to do a better job in "teaching and training" our children, Preston decided to embark on a project to create a teaching tools for kids (and adults) to learn the key Bible characters, stories, events and parables. Since FLASH CARDS are such a widely accepted form of teaching and learning, it only made sense to focus on that form. It is a massive project as our team is drawing over 225 images and writing a brief learning explanation of about 150 words per card! 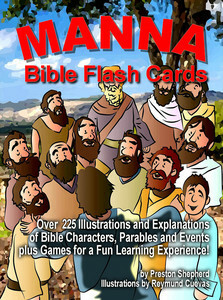 Many people learning things visable so the MANNA BIBLE FLASH CARDS are an excellent mode of learning! We are hoping to release these in the Fall of 2017 - both as part of the MANNA FOR THE MORNING App and a "stand alone" App to be sold separately. 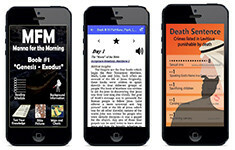 Both will be available for Apple and Android mobile devices. Here is just a sample of our coming cards! The word “manna” literally means “what is it?” (see Exodus 16:15,31). 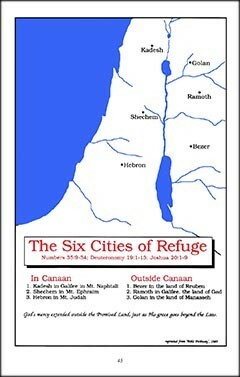 It was the daily bread that sustained the Israelites in the wilderness journey. It was so impacting that Jesus referred to himself as the “bread of life” (John 6:35). 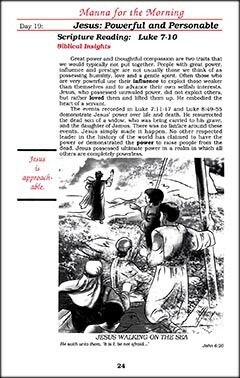 Truly it is the Word of God that sustains and gives all Christians life, meaning and happiness. 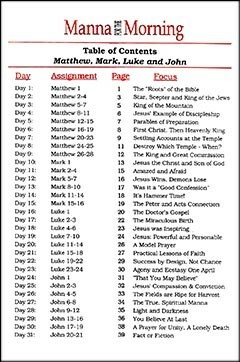 The MANNA FOR THE MORNING™ (MFM) Study Series was written with the goal to help the Bible student grasp the overall theme, outline, characters and teachings of God's Word. Joshua 1:8 - "Keep this Book of the Law always on your lips; meditate on it day and night, so that you may be careful to do everything written in it. Then you will be prosperous and successful." 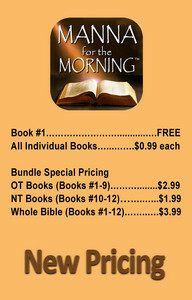 The MANNA FOR THE MORNING™ App was released on May 1st, 2016! 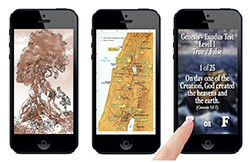 The App is a perfect tool for any Christian wanting to grow in their knowledge of the Bible and their relationship with God! (4) Test your Knowledge - over 40 different exams to see how well you remembered your reading assignment. The App will give you feedback to the number of questions you answered correctly and will also give you the correct answer so that you can learn better. (6) Personal Journal - The User can write down their personal thoughts and insights in their own personal journal. 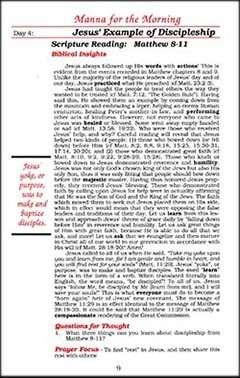 The journal includes: "MFM Insights", "Prayer List", "Favorite Scriptures" and "Notes". WOULD YOU LIKE TO LEAVE US A NOTE WITH YOUR THOUGHTS ABOUT THE MFM APP? Please leave us your contact information below and let us hear from you.